My name is Alex Gates and I grew up in a small town in Northern California. I enjoy a wide variety of things as long they include my wife or some friends. I love the Sacramento Kings and Dallas Cowboys, so you can say a hobby of mine is being disappointed often, which has helped temper my expectations throughout life. I write in the science fiction/fantasy genre because it’s my closest to Narnia, to a new world. I’ve always loved books, and I remember being young, grade school age, and reading the Scooby-Doo Mysteries. I started writing my own little mysteries. Unfortunately, I never showed them to anyone, including the parents, which meant they weren’t saved. Well, maybe that’s fortunate. I continued dabbling with the pen in high school and college, then decided to write my first novel. It sucked! But I hope to clean it up, add some Mascara, clip its nails, and publish it in the same world as ExtraOrdinary. I wrote ExtraOrdinary on a small desk while sitting on a box. It was the worst. My wife and I had just moved into a new house and had ZERO furniture, so I had to work with what was available. My second novel (not released yet) I wrote on a breakfast nook table, because it was our first real piece of furniture, and I finally had a place to sit. I think my favourite place to write is a comfy chair with a movie or tv show playing the back. Football season starts soon, expect me to get a lot of writing done then, while on the couch, possibly in very little clothing. No. I’m the worst with routines. I’m not a morning person, so I’m slow at finding motivation and being productive until I’ve had a massive breakfast and copious amounts of coffee. Then I like a little cartoon action to spark the old imagination, or maybe read a few chapters in a book. Unless I’m teaching. Then I write in the afternoon/evening, sometimes in my office, sometimes on the couch, sometimes in bed, or a coffee shop, maybe a bar. It’s quite chaotic to be honest, but it works for me. I love Stephen King, and would love to write something like the Dark Tower series. I plan to do that on some level with all my books, as he did, connecting each story so they fit in one world. I get such a rush finding commonalities between unrelated books by the same author. What inspired you to write ExtraOrdinary? It was summer of 2015. All these superhero movies were coming out, and I was reading The Amazing Spider-Man, and I connected some thread, put the graphic novel down, and stared at the wall (I do my best creative thinking staring at walls). What if, I thought, superheroes weren’t the extraordinary, but someone without a power? What if the world was filled with super-powered humans, but the hero of the story didn’t have anything? It was the opposite of everything we have been taught to love. The title came immediately. I loved the play on words. The tricky part was figuring out the world they lived in. Drake is my favourite character. The most powerful person a world where everyone is powerful, and he is a wreck. He’s scared, insecure, shy, and he doesn’t know how to survive without depending on others. He was meant to be the bad guy of the book. It turned out he wasn’t bad, just scared and alone in a dying world. He’s by no means “good,” but I think that’s why I enjoy him. All he wants is to find the girl he loves, and he pays steep prices for that. I don’t know. I didn’t write it intending to give a message, but if they can take, that’s awesome. Strength and power are two different things? I don’t know. You read it and let me know what you think! That’d be awesome! When Braiten reached the body, his skin dripped with sweat. The sun was relentless, had been for years, and the black rubber didn’t mesh with his anger, nor did it go along with his thirst. His tongue rubbed against his upper lip like a dry sponge trying to absorb any type of moisture. Sweat dripped from his forehead, chin, and arms, and steam simmered from the tires’ heat. Braiten settled into a tire, locking his lower legs into the hole to help keep his balance. He knelt and inspected the body. It belonged to a male in his late teens or early twenties, about the same age as Braiten. The dead man’s facial hair was still patchy and scarce. Where his skin should’ve been, bones and scales grew. A breeze came through and touched his sweat-stained skin like a cold kiss. He shivered despite the heat. Survivors had the ability to adapt and overcome anything attempting to hurt or kill them, which often came by growing excess body parts or gaining reinforced skin. Because of their disturbing appearance and often unwanted presence, they’d formed a gang and were rarely found alone. Braiten’s knees popped as he kneeled next to the body. The sunlight reflected from an item in the young man’s mouth. He put a finger on the upper teeth and pulled the jaw wider, then turned his head in a fit of gagging. The rotten stench smelled worse than his dry mouth tasted. With his head turned away, he inhaled and kept the breath, then faced the boy again. The jaw had locked, and Braiten tried to pry it open. It snapped under his force. Braiten held down vomit from the sickening noise and regained his composure. I should’ve gone to the bar. What would say has been your biggest challenge and achievement in writing ExtraOrdinary? The biggest challenge was putting together a website to start a little promotion for the book, and formatting the manuscript to look professional on an eReader and paperback. My biggest achievement was doing the aforementioned in a half-decent manner. And publishing a book, of course!!! What have you learned about yourself as a writer through writing ExtraOrdinary? 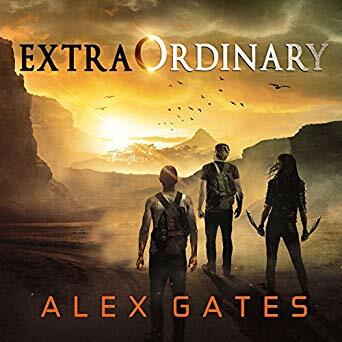 ExtraOrdinary went through two round of professional edits, by two different editors. I learned I’m patient and flexible, willing to sacrifice my words for the betterment of the story. I also learned I need to start outlining before I begin writing! Write. Then write. After that, write! Read. Then read. After that, read! Failure is like an alarm clock, either don’t set it, or hit that snooze button forever so that you can dream and dream until that dream turns to reality. Thank you to Michelle Dunbar and IndieSciFiFantasy for hosting me. Thank you to my readers for reading. Mostly, thank you to my wife for making my dream possible. Book of Raziel: Chapter 1 will be out early 2017. You can go to alex-gates.com and subscribe for my newsletter to get the blurb, cover reveal, and promotional material about that. It is connected to ExtraOrdinary. ExtraOrdinary Volume 2 will release middle of 2017. A young adult connection to ExtraOrdinary focusing on the Rulers will be released late 2017. I also have two stand-alone novels and a nonfiction book that I hope to have done by early 2018.